Famed food TV personality Anthony Bourdain visited Seattle, Bellevue and Vashon Island for an episode that airs Sunday night. Sorry, Amazon, he doesn't have a lot of nice things to say about you. Anthony Bourdain loves Seattle. He’s back with another episode, this time for his CNN series, “Parts Unknown.” It’s a big-picture look at our changing city, but Bourdain-esque all the same. But mostly Bourdain fans watch because they want to know where and what he eats. Among his stops: Pacific Inn Pub (for fish and chips), Revel in Fremont (pork belly-kimchi pancakes, short-rib dumplings, the short-rib rice bowl and noodles with flat-iron steak), Taylor Shellfish in Pioneer Square (fried smelts, oysters and Dungeness crab). He also does interviews at Mamnoon on Capitol Hill, Ocho in Ballard and at the Greenwood bar, the Shanghai Room. Have you been to the Shanghai Room? You should. It is, or was, one of the best-kept secrets in the north end. Check it out here. 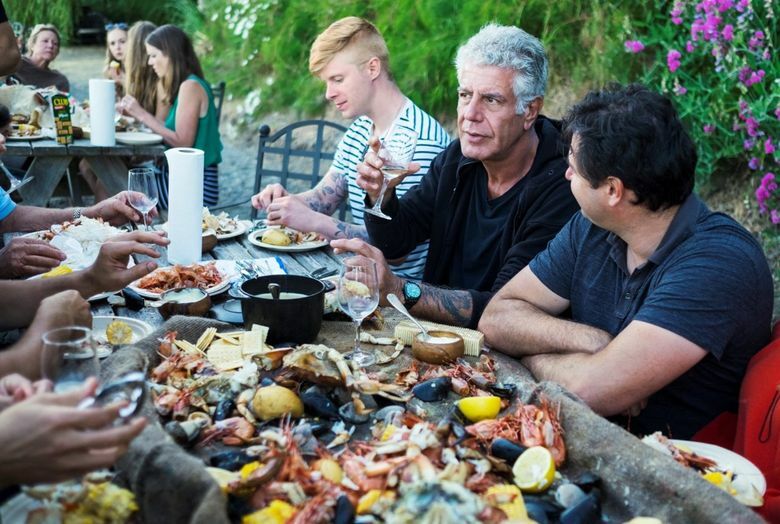 Bourdain also crosses the bridge to Bellevue to geek out on bread with food scientist Nathan Myhrvold at his Modernist Cuisine lab and rides the ferry to Vashon Island for a clam bake. Band members of The Gods Themselves and Seattle rocker Mark Lanegan also made appearances. Here’s a snippet of the new episode, which airs at 9 p.m. Sunday (Nov. 19) on CNN.